I spent today creating my promotional postcard. I love this image of Fairy Godmother and Devil. They look like they are sharing the town secret, and it didn’t take me long to decide they will become the pin-up couple for the exhibition. ArtistatExit0 made a brillant comment on the blog yesterday. He suggested that if some of the puppets sell, maybe the new owners could contribute to the blog by sharing how their Dedes fare in their new home. I love the idea of having a real Dede community. I am not sure though if the blog is the best platform to accommodate such a community, or whether face book would be more suitable. (I am still not particularly familiar with face book). I will mull it over and hope to have something in place before I sell the first one. It would be exciting if the new owners of the Dedes would be willing to participate every so often. And it certainly would make it easier for me to part with them. I want to include parts of the blog into the exhibition. After all, I have 30 meters of wall space to fill. (The puppets will sit on plinths so visitors can walk around them). At the moment I am thinking of having two electronic frames side by side. One showing images used on the blog and the other one showing the matching text. I am not sure if it will work. That is something I dreamt up recently, but haven’t investigated further. And this certainly doesn’t fill 30 meters! 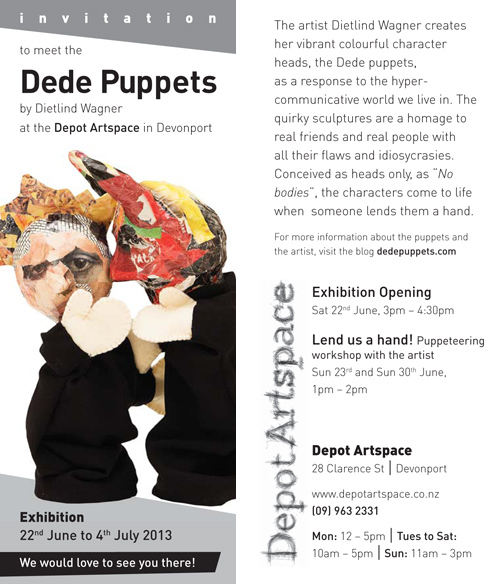 On the two Sundays during the exhibition I will have puppeteering workshops. It became clear in my conversation yesterday that when it comes to playing with puppets everybody just assumes it is for children. Personally, I enivsage the puppets sitting on grandmother’s bookshelf rather than in the kiddies’ toy box. I explained this to the curator. Today I got an email from her telling me about a conversation she subsequently had with some people from U3A (University of Third Age). They seem to be quite interested in the puppeteering idea. Oh, there is still so much to do. For now I am happy that I recovered my spirit from the bottom of the toy box! Working like a Berserker – viel Kraft und alles Gute für die Ausstellung! Thank you! Es tut so gut sich wieder mit den Puppen zu beschäftigen. I love the image on the invitation which is inviting indeed! Best of luck with everything…I’m sure new opportunities will come as a result of your show.